I had dinner with my friend Nate here on a quiet Monday night. Half of the restaurant is devoted to hibachi, so we sat on the other side of the restaurant adjacent to the sushi bar. I ordered the Edamame Bento box ($20) and it came with shumai, rice, miso soup, salad, a California roll, and then a choice of two items. 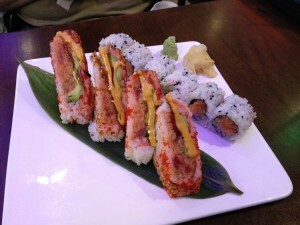 The options included different terikayis and tempuras, as well as sushi and sashimi. I asked to have double sashimi. 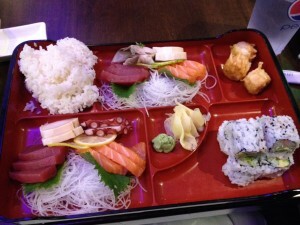 The Bento box was generous and came with the selection of tuna, salmon, mackerel, octopus, and yellowtail. The cuts were even and well sliced. The salmon was my favorite, I thought the tuna was a bit watery and flavorless and the other fish was nondescript. The shumai was fried, which was strange. Nate got a roll called a spicy tuna sandwich ($14) which was tuna and avocado, layered with rice that was made to look like a sandwich. He also had a Alaskan roll (salmon, avocado, cucumber, $5.75) He thought the sandwich was an unique take on a sushi roll. Our waitress was attentive; Nate never had to wait long for a diet Coke refill. We had a Groupon, which made it more reasonably priced, than it actually was.